Note: Stiffener tube weight calculated using two 72" (1829mm) tubes with a joining sleeve as per 1260-ST drawing. 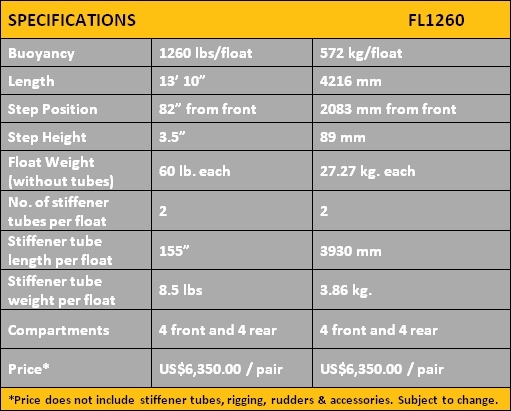 A pair of FL 1260 floats will support an aircraft with a gross weight of up to 1260 lb. (572 kg.). One Mono 1000 float (a single FL1260) will support an aircraft with a gross weight of up to 630 lb. (286 kg. ).